The carbon fibre bed is expected to be among a significant number of changes in materials for the next Chevrolet Silverado. 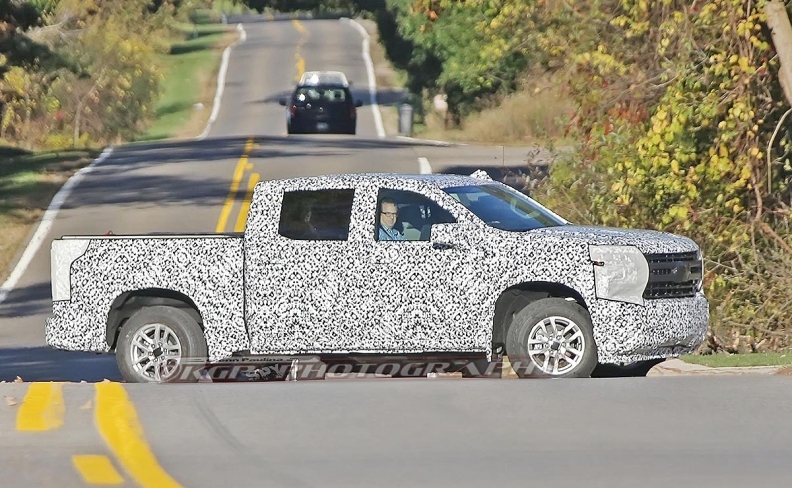 Pictured is a recent Silverado test vehicle caught by a spy photographer. DETROIT -- General Motors plans to use carbon fibre for the beds of its redesigned full-size pickups to improve performance and reduce weight, Automotive News in Detroit has learned. Carbon fibre, according to one source, is expected to be used as part of a mix of materials for the box of the pickups, including aluminum. The truck beds could mark GM's first use of carbon fibre reinforced thermoplastic, a product the automaker announced it was co-developing with Japan-based Teijin Limited in 2011. Carbon fibre is considerably stronger and lighter than steel and aluminum, but it's more expensive, mostly because of a long, labour-intensive production process. As a result, the composite is used only for select parts in low-volume vehicles. The carbon fibre bed is expected to be among a significant number of changes in materials for the Chevrolet Silverado and GMC Sierra pickups to meet progressively stricter fuel economy regulations and better position them against crosstown rival and truck leader, Ford Motor Co.
GM, as first reported by The Wall Street Journal, is anticipated to begin offering the carbon fibre beds within the next two years. The Journal reported that the carbon fibre beds would go in premium versions of the pickups, but more efficient production processes could help the automaker eventually offer carbon fibre beds in lower trims. The redesigned Silverado and Sierra pickups are expected to be unveiled soon and go on sale next year without the carbon fibre beds. It was unclear how much the carbon fibre would add to the price of the trucks. GM’s Oshawa, Ont., plant might be assembling some of those trucks. During labour negotiations with Unifor in late 2016, GM committed to invest $400 million in the Oshawa plant over the life of a four-year contract. Much of that investment would go toward refurbishing one of the plant’s two assembly lines to assemble pickup trucks. “The plant is going through a transition as we prepare it to build trucks,” GM Canada spokeswoman Jennifer Wright recently told Automotive News Canada. She would not confirm when the plant would begin truck assembly or what model the plant would build. Wright said the move is partly the result of declining car demand in North America — the Oshawa plant also assembles Chevrolet Impala and Cadillac XTS — and particularly in the United States, where sedans are largely being shunned in favour of crossovers and pickups. In Canada, trucks have accounted for more than two-thirds of all the vehicles sold in 2017. GM Canada’s truck sales alone are up 21 per cent to 223,177 units. Then-GM CEO Dan Akerson vowed to cut the weight of new vehicle models 15 per cent by the 2016 model year.